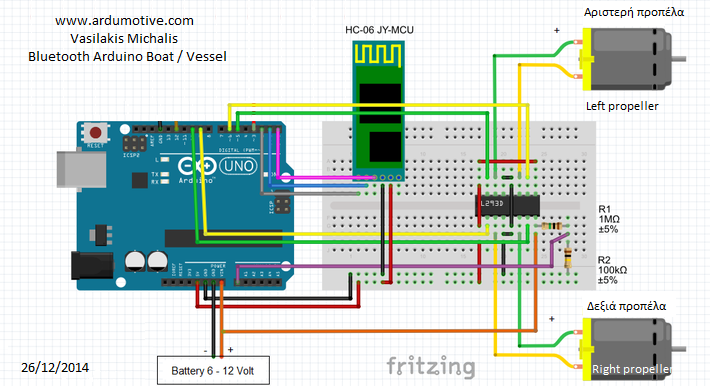 In this project you will transform a simple RC to an Arduino Bluetooth controlled boat! Your new boat will be able to controlled through your Android device, smartphone or tablet. So, let's get started! Select the tabs below to navigate through project details. RC Boat that can fit all the above ! Optional you will need 1x1MOhm & 1x100KOhm resistror to add a battery level control function. For power, you can use the existing batteries (4x 1.5V AA), or replace them with a LiOn rechargeable battery pack. See the images below to understand how to control motors to navigate your rc boat, imagine that you are looking it from behind. On simple RC boat toys you will find a "two propeller navigation system". That means you don't need a rudder for changing directions. If your boat has one propeller and rudder, use this guide. If you have a "big" rc boat/vessel it will need more power so you can use L298 module board. L293D motor driver will give max 0.5A per channel and it will be come very hot after while. L298 module board has a heat sink and can give 1A per channel, but is bigger than L293D. Read more about L298 module here. Read every line of code (+comments) to understand how it's working and then upload it to your Arduino uno board! 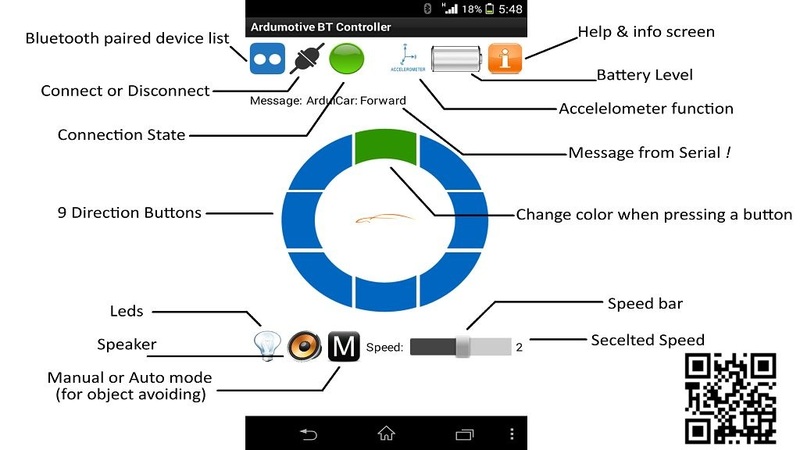 To program your board you must first disconnect the RX & TX pins of Bluetooth module. Use "Help & info" button if you can not understand how it is working. Accelelometer function is under developing, use with attention!